People who have seen the light when it comes to social collaboration technologies (Yammer etc) often complain that one obstacle in making these tools work is the fact that employees are not rewarded for sharing information and being collaborative. Blaming finger often points at HR, the custodians of the official reward system (money, promotion etc). That said, I’ve come across more and more examples where HR have changed the way they reward people because of enterprise social networks. They want to discourage information hoarding by rewarding information sharing and other “intrapreneurial” behaviours). But how far are big companies in this type of thinking? Would someone at a major management consultancy firm be able to shed some light on this? I contacted Bill Schaninger, director at management consultancy giant McKinsey, to hear what his thoughts are on HR and social collaboration seen through the lense of change management – change management because when organisation is in a flux it’s actually possible to change old ways of doing things (good luck getting anything through in business as usual environment). Bill focuses on organisational change and does work around McKinsey’s organisational health metrics. Virpi: With the rise of enterprise social collaboration there is suddenly a wider interest in social network analysis. What role does SNA play in next generation org. analytics? Bill Schaninger: At McKinsey, we believe that companies need to develop strong change leaders employees know and respect—in other words, people with informal influence. This isn’t just a hunch: employee resistance is the most common reason executives cite for the failure of big organizational-change efforts. 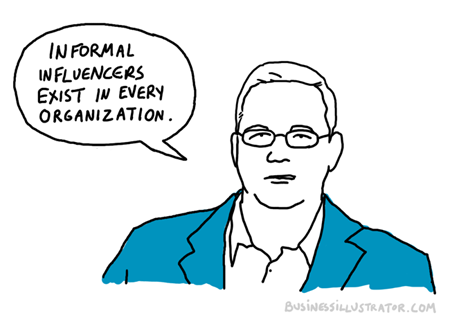 Informal influencers exist in every organization, across industries, cultures, and geographies. The challenge is identifying these people; we find that even when company leaders believe they know who the influencers will be, they are almost always wrong. We’ve found “snowball sampling,” a simple survey technique used originally by social scientists, to be particularly effective in identifying hidden influencers. Through a brief survey, recipients are asked to identify acquaintances who should also be asked to participate in the research. Thus, one name or group of names quickly snowballs into more, and trust is maintained, since referrals are made anonymously by acquaintances or peers rather than formal identification. Once identified, influencers can be encouraged to help communicate necessary changes, convince skeptical employees of the need for change, or, best of all, do these things as active architects of the program. The most powerful way to use hidden influencers is to bring them into such efforts in the earliest stages and to get their input and guidance on planning and direction—as well as help with execution. Changes made with the support of these influential employees are vastly more likely to succeed in the long run than changes delivered from on high. Virpi: Do you think HR should start acknowledge and reward “emergent leadership*”? And if so, what tools could help HR do this effectively? Bill Schaninger: We took a look at what the healthiest and highest performing companies in our Organizational Health Index database and found that they each seemed to follow one of four patterns of processes and behaviors. We call these patterns recipes and they resemble a philosophy of management. We have found that companies that follow any one of these four recipes are nine times more likely to achieve top health; to put this in context, top health companies out-perform the stock market by a factor of three. The “Continuous Improvement Engine” recipe relies most heavily on the idea of intraprenuership. Organizations that follow this recipe gain a competitive edge by rewarding employee innovation and involve people in driving performance, gathering insights, and sharing knowledge. These organizations are internally competitive, creative and entrepreneurial, and rely heavily on employee involvement. Another places where intraprenuership shows up is in the Market Shaper recipe, where every employee is encouraged to contribute to the quality and flow of new ideas and is rewarded for the ability to adapt and shape the organization as needed. When organizations follow the Talent/Knowledge Core recipe, they create value by identifying and attracting top talent, cultivating expertise, providing opportunities for growth, and inspiring personal ownership. The Leadership Factory recipe is, in fact, the only one that is more traditional in its cultivation of managers and leaders first. Virpi: How do we best support intraprenuers? Bill Schaninger: Going back to the example of the Continuous Improvement Engine above, the key strategic element is getting employees actively come up with new ideas and creative solutions to solve problems and capture new opportunities. In order to do so, the right support needs to be put in place. Part of that is in attracting the right talent. People that are successful in a continuous improvement environment are driven by deeply held meaningful values and a sense of personal ownership for the collective success of their team and business. They openly share these ideas — with each other and with business leaders. It is then incumbent upon leaders to create a strong culture (including rewards) for sharing — not hoarding – information. Processes and systems make it easy to identify and implement the best ideas – and the same sense of ownership that drives creativity also drives people to quickly adopt new better ways of working. Managers need to be clear and transparent about performance against goals – so that employees see opportunities for improvement and have a sense of healthy competition to outperform their targets and each other. Finally, incremental innovation comes from challenging working teams to be creative and come up with ideas for all sorts of business problems, from efficiency gains to product extensions. Virpi: Is employee engagement the right metric? Bill Schaninger: We believe that while employee engagement is necessary, it is incomplete in terms of offering true understanding of how an organization works. Organizational health, on the other-hand, provides a measurable, actionable diagnosis of how a company’s organizational strategy is impacting its performance against strategy. Embedded into a long-term strategy, a focus on organizational health has helped our clients to achieve a 9% increase in EBITA in 12 to 18 months. One way in which organizational health insights can be implemented is in creating agile organizations. Agile organizations adapt rapidly and flexibly to market, environmental or internal changes in a cost-effective way. The crux of agility can be found in four paradoxes: agile organizations must become highly stable and highly dynamic at the same time, change less by changing constantly, move faster by getting more people involved, and get more control by giving up more control. Virpi: What is the role of social collaboration? Bill Schaninger: With the advancements in technology, we see a near future where sweeping change will bring digitization to the workforce. The McKinsey Global Institute estimates that up to 45 percent of the activities employees perform can be automated by adapting currently demonstrated technologies. This will require a sweeping rethink of organizational structures, influence, and control. The current premium on speed will continue, to be sure, even as a new organizational challenge arises: the destabilization of the way people work. In order to succeed in this environment, digitization must be embraced and used to create flexible workforce platforms—software layers that help executives allocate collections of workers’ skills against a wide array of projects and processes. Companies can deploy such a platform even as they lower overhead costs and improve their responsiveness and flexibility. *Emergent leadership: voluntarily taking a leadership role even though one’s position doesn’t require it.